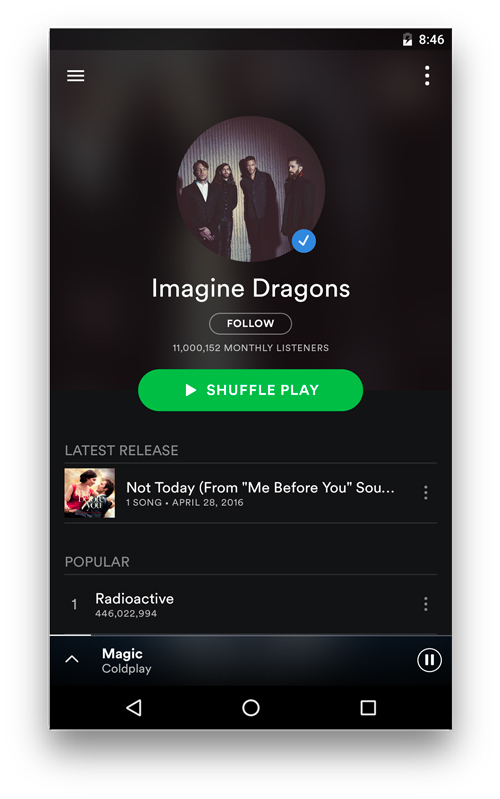 Spotify, like most services, is available in both – free, and paid version. 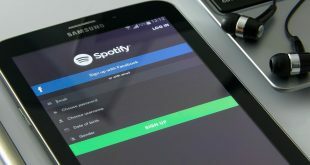 You can listen to the free version of Spotify from anywhere in the world by using a VPN or pay $9.99 per month. 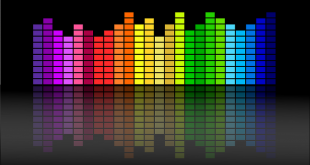 You, not only get ad-free music but also, the ability to listen to high-quality music and download it on your system. But what really bugs me in the free version, is not having the option to jump tracks, which is why I decided to try Spotify Premium, only to find out, Spotify premium is not available in my country due to distribution rights. It turns out, if Spotify is not officially available in your country, you also can’t enjoy its ad-free premium version. 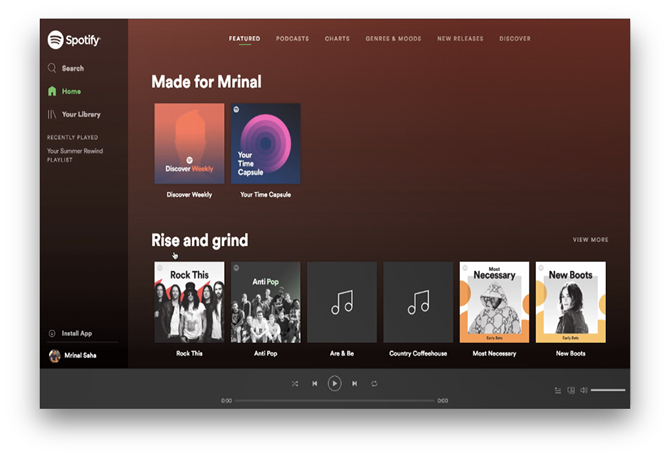 For example, you can get the free version of Spotify in India by using a VPN, however, if you want to sign up for Spotify premium of US, you’ll need the US credit card or a Paypal account of that country. But fortunately, there is always a way. I was finally able to get Spotify premium even though it’s not officially available in my country. Let’s find out. Listening to the Spotify free version requires a VPN. If that’s the case, just skip to next part. If not, then I’ll recommend getting a good VPN on your computer. 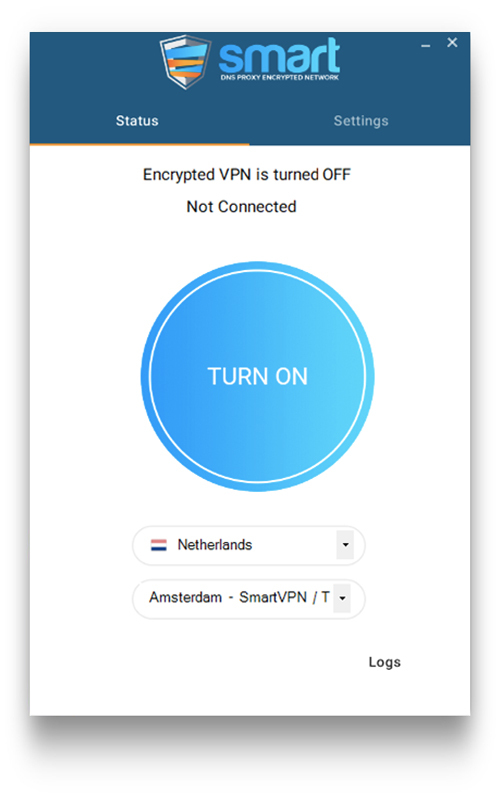 Proton VPN and Tunnel Bear are decent options for a free VPN but if you are looking for a good VPN and are ready to pay ($5/month), you can choose between Nord VPN and Smart DNS Proxy. Once you have a VPN, keep it handy, we’ll need it later on. Next, we need to buy a gift card for Spotify premium, as it only accepts a US credit card. There are few sites that deliver, we generally use MyGiftCardSupply and Target (recommended). None of these sites need a US credit card or PayPal to buy a gift card. 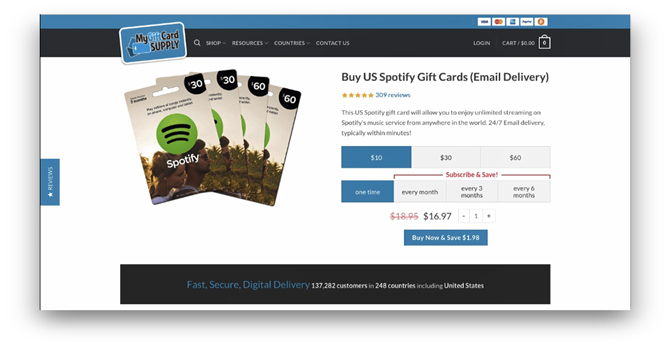 Most dedicated gift card (like MyGiftCardSupply) sites sell a $10 Spotify gift card for roughly $17, which is a tad too expensive in my opinion. If you have a friend or relative living in Spotify supported the country, I would recommend asking them to buy the gift cards in bulk for you. They’re easily available at Target or Walmart stores. The other alternative is to buy Spotify gift card from Target, they sell a $10 Spotify for $10 only (no commision). However, you can only buy 2 gift card at a time and will have to wait up to 4 hours, to get the card delivered to your email address. 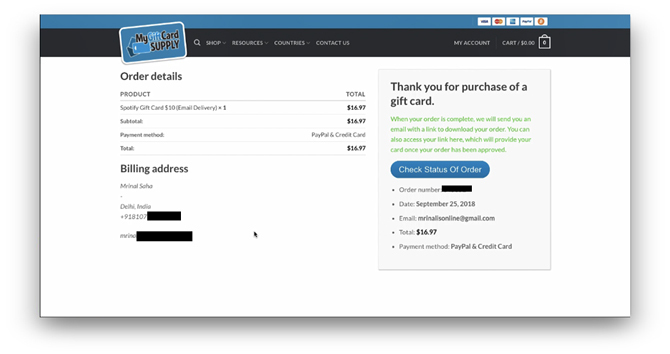 Anyways, for this instance, we’ll just go with $10 gift card from MyGiftCardSupply, as they deliver the card within a minute of payment. So, add it to your cart and check out with the PayPal account. Enter your name, email and verify your phone number. Once done, you’ll get the code in your email with a minute or two. They sometimes deliver the scanned copy of a physical card by email and the other times, just the code. Once you get the code, copy it to your clipboard. Next, turn your VPN ON and make sure the server is set to the United States since that’s the gift card we bought. Say, if you are buying an Australian gift card or using PayPal, make sure you switch to respective country’s server like Melbourne. Now, head over to Spotify gift card redemption page, if you are not already logged on to Spotify, do that with your Facebook or email. It’s important, that you sign up for Spotify premium on the website and not in the app. Apple takes a cut of every in-app purchase from the App Store, so if you sign up on your iPhone, Spotify Premium is $13/month instead of the usual $10/month. Next, simply enter the gift card code. You might see a message that if you enter a gift card ‘you won’t be able to enjoy a month free trial’, it’s a tempting offer but doesn’t fall for that. If you want the Spotify offers, you need to link your credit card or PayPal, and that not being the case with us, we’d simply enter the gift card details. And there you go, now have Spotify Premium. 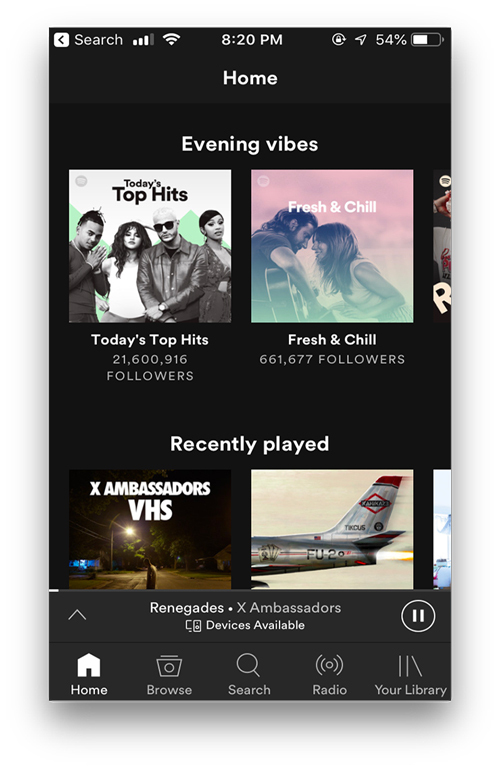 You now can listen to Spotify premium with no ads and unlimited skips. To get Spotify Premium on Android, you need to sideload the Spotify APK from sites like ApkMirror. It’s the only source I trust. 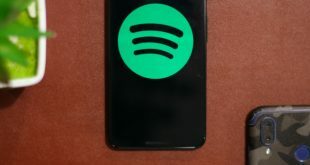 Make sure, ‘Allow installation from Unknown Sources‘ is checked on your Android Settings, and then install the Spotify app. Next turn ON your VPN and switch to the US server. 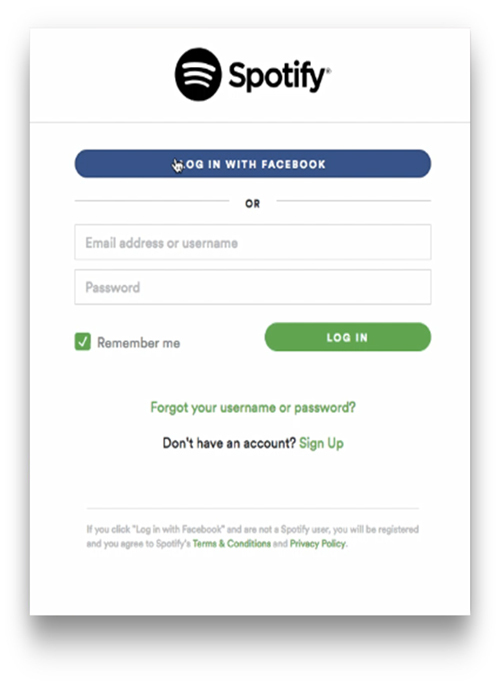 Login into the Spotify app with the same credentials we used before. Once you do, you can enjoy Spotify Premium on it. If you already have the app installed, simply log out and log in again to get the premium features. Similarly, to get Spotify Premium on iPhone, you need to change your App Store to the US, to download the Spotify App. 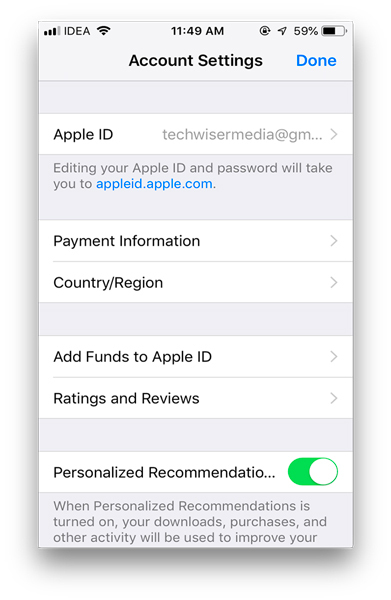 To do that go to Settings > iTunes & App Store > Your Apple ID > View Apple ID. Log in to your Apple ID, by typing in the password. Now, you should see the option to change the country. Now, tap on Country/Region > Change Country or Region. 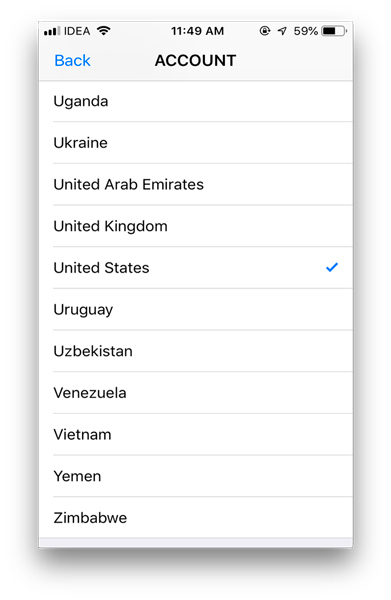 From the drop-down list choose the United States. A new window will open the tap on Agree on top right to save changes. You will have to fill in a billing address and tap on “Next” to continue. Again, just like we did with the Android, turn on your VPN and switch to the US server and log in. So, this is how you get Spotify Premium from anywhere in the world. In my opinion, Spotify Premium is one service that’s worth paying for, especially if you listen to music every day. The downside is of this method is, you’ll have to buy a gift card to renew your subscription. But if you like the service, it’s worth it.